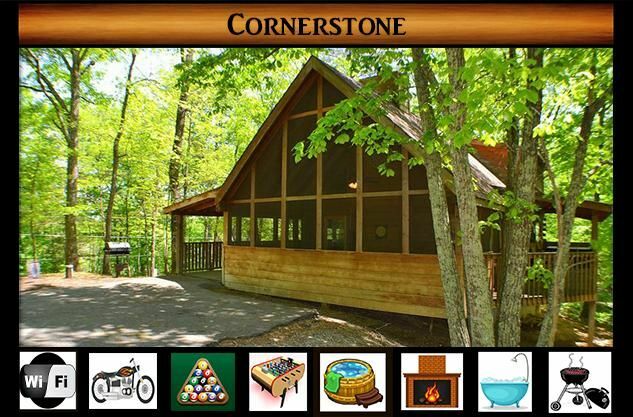 Come and make CORNERSTONE the foundation of your Pigeon Forge vacation! This lovely 2 bedroom, 2 bath real log cabin is located just 5 miles from the Parkway, has level parking and is accessible via all paved roads. The cabin is located near Hidden Mountain West Lake #2. The main level open concept living area includes a vaulted ceiling, Queen sleeper sofa, Smart TV, DVD, and gas stone fireplace. There is a fully equipped kitchen and dining area large enough for 6 guests. The main level king sized bedroom includes TV, a bath with shower and a stone surround Jacuzzi tub. Upstairs the open loft second bedroom includes a king sized bed, TV, XBOX 360 and an attached full bath with tub and shower. Sit and enjoy the swing and porch rockers located on the full length covered front porch or relax in the new hot tub situated off of the main level bedroom on the back porch. The screened in side porch contains a foosball table and pool table for you and your guests to enjoy. The outside area provides a charcoal grill and picnic table for outdoor dining. Secure your vacation dates now and begin building wonderful memories at Cornerstone! This is a strict NO pet & NO smoking cabin, the owner has severe allergies and cannot be around them. PLEASE respect the owners and do NOT have pets or smoke on the property. This cabin will be decorated for Fall & Christmas to keep guest in the spirit of the season & holiday during their stay! Located less than 6 miles from the parkway in Pigeon Forge: go down Wears Valley Road about 3 miles, turn on Waldens Creek & cabin is 3 miles from there. *Within 30 days - whatever dates we can rebook, this is the amount that we will refund back (-$50). Example: if you had 5 nights & we rebooked 4 nights = you will be refunded 4 night+tax+cleaning fee+damage fee+Bear Tootin fee ($25) - $50 cancelation fee. *Out of respect for the holidays and for our employees, we do NOT allow checking in or out on Thanksgiving Day, Christmas Eve or Christmas Day. Great place to stay. Conveniently located to pigeon Forge. We are so glad you enjoyed your time at Cornerstone! We hope your vacation was perfect and we would love to have you back! Loved the cabin, all wood, comfortable beds, clean cabin, met the owners were a surprise, but loved it. They were a wonderful couple that take pride in their cabin and giving the best experience to their customers. The only thing I didn't like was wearing playing pool in the screened in porch when cold outside. Perfect place for it though in the warmer months. Thank you so much for the experience!! The cabin was great! Would have gave it a five star but the jetted tub was dirty. Hair and dirt coming out the jets. Overall it is a beautiful cabin and very peaceful outdoors. We are so sorry about the jets in the tub. We will have our housekeeping made aware of it to make sure it is checked. Those are the kinds of things that are very hard to catch because when they clean the tub, sometimes the jets are not ran. But we will definitely check on this. Thank you for letting us know and we are glad you enjoyed your stay! We really enjoyed our stay! Hate that it’s over but looking forward to the next trip! Thank you! We are looking forward to having you all back again! Glad you enjoyed your stay! My family of 3 and my sister and brother in law stayed the week of Thanksgiving. There is a gas fireplace that was going all the time. The hot tub was clean and got a lot of use. Fully stocked kitchen. The beds were comfortable. There is a big jetted tub in the downstairs bedroom. The hot water ran out before it got to the jets and the tub stopper didn't hold the water in the tub, it was seeping out slowly. Having a full bathroom upstairs and downstairs was very convenient. I loved the no stair entry. My daughter is in a wheelchair so it made it easier for us. We would definitely stay in the cabin again. It's 3 miles from the strip. We enjoyed our stay. We are glad you and your family enjoyed your stay at Cornerstone! Sounds like lots of beautiful family memories were made! We would love to have you back again soon! Thank you! very nice but could use a plumber. Shower and both bathroom sinks drain very slow and downstairs toilet has problem with flush but works fine if you dump bucket of water in bowl. I didn't check it but it may just need float adjusted. Kitchen faucet leaks around handle and probably needs new O ring. Thank you for letting us know. We are looking into these issues.